Dr John Lamplugh Kirk was a doctor from Pickering and an avid collector of ‘bygones’. His collection was opened as York Castle Museum 80 years ago on 23 April 1938. Over 32 million people have since visited. Dr Kirk wanted the focus of his museum to be on the objects shown in their original context, and the museum became the first of a new kind in Britain. A team of dedicated people helped Dr Kirk realise his vision, including curator Violet Rodgers. Read about her life at the museum below. 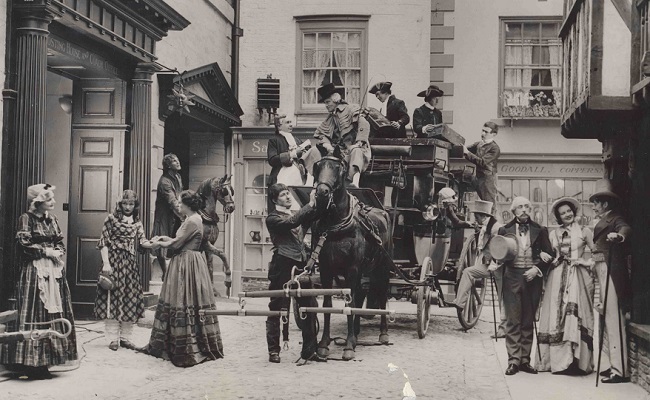 Above: Costumed characters on Kirkgate, the recreated Victorian street at York Castle Museum. We’re not sure how Dr Kirk and Violet met or how she came to work for him, but in January 1938 Kirk wrote to J. B. Morrell (a fellow collector and supporter of Kirk’s vision) that “Miss Rodgers is promising” and requested that she be paid £1 a week “until such time as your committee can confirm her status”. During the Second World War, Violet was left to run the museum as Deputy Curator. Despite having signed up for the Museums Association Diploma (a relatively new professional qualification at the time) and effectively being in charge of the entire museum during the war, Violet was not paid the same as a male equivalent. In 1941, Violet was paid £150 a year; she requested a pay rise of £200 a year, which was accepted by the committee, and was given a further pay rise to £225 in 1943 going up to £250 in 1944. However, written evidence from 1939/40 shows that Kirk was advised to pay the new curator £350 a year. After the war, Violet was forced to take a pay cut as a new male curator was appointed. She wed Wladyslaw Wloch in June 1947 and the couple held their wedding reception on Kirkgate. That same year, Violet left the museum for a new life in Poland with her husband and three children, Irena, Halina and Lydia. The family moved back to York in 1960, and Violet died here in June 1978 aged 64. Find out more about York Castle Museum’s history and collections on our website here, or why not make a visit?